Schipol International Airport taunted me like Huckleberry to Tom – daring him to trust a raft made of sweat, spit and good old fashioned nylon rope. My heart and stomach clung awkwardly to the Boeing’s ceiling, unconvinced of a safe landing….both on the runway and on the stage. My husband reminded me of a Sunday afternoon frozen yoghurt in Stellenbosch…were we in the same aircraft? The AIN conference was scheduled from the Thursday morning until the Sunday afternoon. Our venue…The Felix Meritis, staircases’ would be home to 24 accents trading experiences, laughter and general out of breathness as the building was spread over 5 floors. As an introvert, the idea of 3 people crammed days was daunting to me. The deer caught in the headlights image pops to mind. Beautifully contrasted with this thought was my husband… a healthy, well fed wild mustang…energized by the breathing in and exhaling of gusts of words from strangers about to become friends. 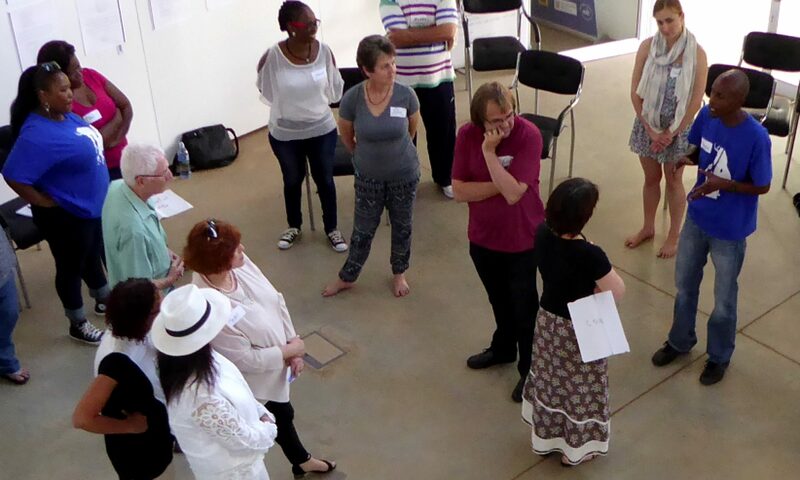 We both joined Adrian Jackson’s pre conference workshop on Augusto Boal’s “Theatre of the oppressed” on Thursday… “Yes, an additional day with, what my very unhelpful conscience, proceeded to tell me, were people living the Improvisation dream. I had recently fallen in love with it, but we were by no means an item in my eyes yet…unbeknownst to me…Improv had found its soul mate, and he was planning to propose every day from then on for the rest of my life, and I was going to say yes. Have you ever met really nice people from a certain country at different intervals in your life? They inadvertently form your opinion of that country. Improv people are like that country; I have never met an improviser I didn’t like. They are open, accepting, honest and possess an enviable children’s quality called a sense of wonder. Saturday, fear was up before I was. I could have sworn I smelled it smoking a cigarette on the porch, nervously tapping its foot. Burgert and I were presenting our “Make your Partner cook good “a cooking workshop for couples later that afternoon. Burgert and I had attended pre marital classes based on Imago relational therapy and were so moved by the principles that we designed a workshop that married it with our other great passions – Improvisation and Creative cooking. We had presented this to test couples in South Africa and were left speech less at the beauty of 2 people working at a relationship. My fear, in retrospect, was that I would be out of my depth. But, the thing with relationships is – if you’re in a committed one…it is a ship, and it will float and brave every storm without fear of failure. I joined Amy Carrol – her topic was “Are you predator, pray or partner?”, The Art and Science of Positive Influence. Burgert found his way to “Creative Conflict Resolution” with Barbara S . Tint. These are 2 remarkable women with finesse for performance with depth. Just after lunch we both attended the “Hero’s Journey as a universal pattern for Personal and Cultural change in Organizations” …again, rich with content and the freedom of expression. And then we were up… The proof is in the pudding. The feedback ( I love this word) on our workshop was down right pleasing and instilled a quiet confidence that what we do has the potential to make a lasting difference. As we flew home the next Sunday I closed my eyes somewhere in mid flight and smiled…for I was in the absence of fear. Previous PostPrevious Why do we lose our creativity when we grow up?